This past month's been a whirlwind trying to get everything ready for the grand opening of the Apartment 528 Store. The store, opening September 1st, will feature products from some of my favorite designers and brands. Each item is hand-chosen and guaranteed affordable. In fact, almost all the products in the Apartment 528 Store will be UNDER $50. Can't beat that! To keep things fresh and exciting, I'll slowly add designers to The Store. Today, I'm giving you a sneak peak at artist/designer David Paul Seymour, a man after my own heart. David's bright, retro graphics can be found on art prints, tote bags, greeting cards, and more. I couldn't think of a better designer to kick off the Apartment 528 Store! 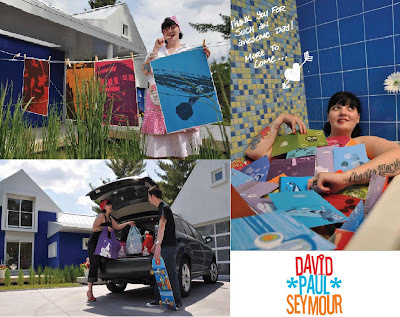 To meet David and read more about his work, check out the interview below and stay tuned for an upcoming giveaway from David Paul Seymour. What was the first product you designed? I don't know if you could consider it a product, but I designed a very groovy armchair in Architecture school that was quite a hit. Also, I started creating my own comic books when I was 3 if that counts. Judging from your work, I'm guessing you're a big fan of the 50's. What is it about that time period that you love? I am indeed a fan of the 50s and 60s and even 70s. My affinity for those periods have meant something different over the years and as I get older, the meanings become more indepth. Now that I'm a thirty-something guy homeowner on a culdesac in a suburban neighborhood with children and a wife, I realize this idealized "Leave it to Beaver" neighborhood fantasy I've held dear because I yearn for life to be that way. It's come to inform the mission and purpose of my company. To revitalize the spirit of those days, both aesthetically AND philisophically. Don't get me wrong, I'm a card-carrying liberal artsy-fartsy type, but I do feel there's a sense of values, a connection to neighbors and community and a pride in both creativity and craftsmanship that have gone totally out the window. I use that "retro" vibe as a reference or starting point because I want my company to pick up where designers like The Eames' and George Nelson left off. Color, form, bold and daring design, big fins and chrome on cars, men dressed sharp and women wore flattering, feminine clothes and nobody would ever dare leave the house wearing sweats. Ick! I commend to everyone my contributorial column to the AIA Minnesota blog "Threshold" that I do a couple times a month called "Strip-Mining the Suburban Archeaology"
Is your home a 1950's timewarp (I mean that in a good way!) with bright colors or is your personal style different from what you create? As an architect-turned-designer, my home is a pretty balanced thing. It's an old Midwestern Split-Entry, but it's far from a time-warp as everybody always suspects. It actually could be considered very tame in that regard, and I owe that to my wife. We have a lot of Ikea and West Elm (fun and modern for struggling early 30s, right?) but also have some cool vintage pieces. We own a 1961 Telefunken console stereo from West Germany that serves as both guest-entertaining music source (One of these days I'm going to rig my Ipod up to it) as well as cool credenza, a 1940s Russel Wright dining table, some Brody chairs, a couple Eames chairs, etc. And yes, of course, there's bright colors both in the paint color choices (which we've also balanced and employed strategically...usually a room is done in a "neutral white" mostly, then we use the bold color, say, on one particular wall and on interesting forms in the room) as well as in accents, furnishings and artwork. Out of the different products you design, what's your favorite to create? Over the last 5 years I've designed (and sold out of) posters, skateboards, watches, t-shirts, even an illustrated cocktail guide; now I've got posters, greeting cards, reusable grocery bags, a boardgame in development, downloadable houseplans in development, a new skateboard line, Tee-Shirt line and even men's and women's apparel in development. 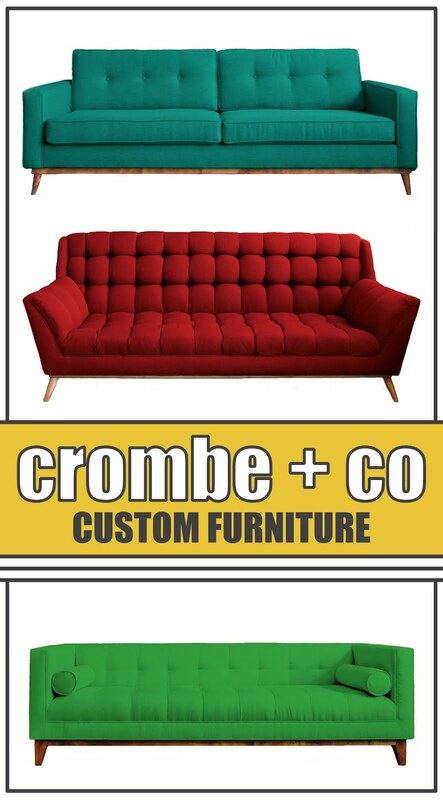 It's funny, cause in all of those things I think I still get the most instantaneous gratification from doing posters. It's the only thing my wife allows me to create and put up for sale without a company committee. :) A fella's gotta have his one thing, and that's my one thing. I dream them up and post them up. I love it. All these other things take SOOO much time to tinker with and develop and find the right people to make that it drives me kinda nuts - It's totally necessary for it to be up to our standards - but it's nice to have something that's so like primitive that I can just get my hands dirty and make with no one's blessing and with no one contributing in any way to the process. When did you make the leap from artist to artist/designer? As I said before, I actually made the leap from interning architect to artist THEN to artist/designer. I left the last firm I worked for back in 2005 because I was doing so well selling artwork and doing art shows. I realized at that time that I didn't care much for not only working FOR someone else, but I didn't much care for dealing with clients and those kinds of limitations as well. It took me only about one year to realize I liked creating on my own terms, but hated standing around art galleries hoping someone would buy my stuff. I still sit around hoping people buy my stuff I guess, but I had to move in the direction of creating stuff that meant something more than hanging on a wall. I am very practical in that way. I have to create things for the masses that are everyday usable, practical and fun. I'm on a mission to change Americana and create positivity through good design and products that will ultimately reconnect America with its interupted trajectory of a unique national design identity. I just couldn't do that hawking paintings and prints. Favorite band or type of music? I was a total skateboarding/surfing/punk rock kid in high school, and I still love punk rock (favorites: Agent Orange, Fugazi, Black Flag, Bad Brains) a lot and I still skateboard and snowboard. That usually shocks people, but it's true. Since my 20s I've loved jazz (Favorites: Miles, Al Hirt, Coltrane, Mingus, Stan Getz), lounge (Favorites: Astrud Gilberto, Sinatra, Martin Denny), surf rock (The Ventures, The Trashmen), and Oldies Rock (Favorites: Elvis, Buddy Holly, Johnny Cash, Jerry Lee Lewis). I only listen to old vinyl records on a vintage turntable through 30 year old Klipsch speakers when I'm working in my studio, so I actually own all these on vinyl and still buy them and that's all I allow when we're working in here...I have total dominion over the music in here. :) When I'm out roaming though I do the ipod Shuffle, cause I'm so ADD that I love not knowing what I'm going to hear next, it's like my own personal radio station. I could hear anything from the Dead Kennedys to Dean Martin. I admit I haven't read any works of fiction in probably 10 years. The last REALLY awesome book I read was the monster, mammoth 912-page "Walt Disney: The Triumph of the American Imagination" by Neal Gabler. What a total inspiration to me! Other books I've come to treasure and re-read is "The Tao of Jute Keen Do" by Bruce Lee, "The Seven Spiritual Laws of Success" by Deepak Chopra, and "The 7 Habits of Highly Effective People" by Steven R. Covey. I'm currently reading "The Art of the Start" by Guy Kawasaki. What's the one thing in your home you couldn't live without? My family. The rest could burn to the ground for all I care. Okay, maybe my external harddrive. It's got all my design scans, printing files and generally every business document we've created or used. Oh, and family photo albums even more than the harddrive. Little momentos from the kids growing up. The 2 time capsules we made for each of the kids when they were in the womb. What's next for David Paul Seymour, the brand? Tell us a little more about the Culdesac board game. How did this project come about? I actually have a seperate company for that project alone, and I work on that with a cool dude named Dan Benson. It's a game based on a kind've "coloquial" folk game played by Midwesterners when they'd go snowbirding down in Florida in the 50s, so the whole thing - the game itself, the way the graphics and materials of the game are and the actual theme of the game that we added into it are all very much about retro suburbia, tying people together for social connectivity (game night is coming back!) and generally making people feel good. Congrats! love the interview postings. Yay, can't wait for the new store - congrats! Great interview. What a cool artist, his new projects sound very interesting. I'd love to see that board game! Great interview! So glad to have found your blog.